Lake Burley Griffin in Canberra, attracts tourists from all over the world, and a number of these tourists are from mainland China. 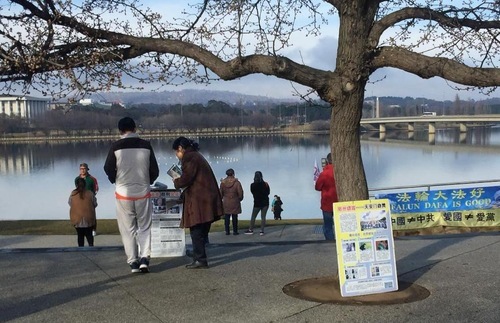 Falun Gong (Falun Dafa) practitioners have been persistently raising awareness at Lake Burley Griffin every day with displays and exercise demonstrations. The Chinese Communist Party (CCP) has defamed Falun Gong with false propaganda and deceived the Chinese people. However, due to practitioners’ tenacious efforts more and more Chinese people have learned the true story behind the persecution. Ms. Chen further told the woman about the Self-Immolation Hoax, how the CCP had sacrificed people’s lives for fake news, and brought disasters to the nation by destroying China’s traditional culture and polluting the environment. The woman kept nodding. The woman told Ms. Chen that she had quit all of the Communist organisations she had once joined. They talked with each other for a long time, until finally the tour guide called for all the tour group members to board the bus. Falun Gong practitioners in Canberra raise awareness to Chinese tourists at Lake Burley Griffin in Canberra. 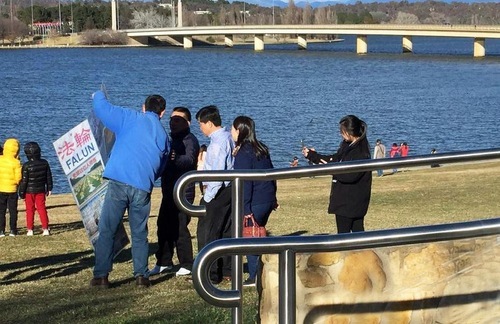 A bus loaded with Chinese tourists stopped in the park at Lake Burley Griffin one day. A Falun Gong practitioner named Ms. Zheng handed each tourist a flyer. Some tourists gave her the cold shoulder. The tourists soon began taking pictures of each other on the lake shore. Ms. Zheng is a professional photographer, so she offered her skills to a Chinese couple. “I will be glad to take a picture for you two. I am a photographer,” she said. The couple replied coldly, “No need.” The woman glanced at the Falun Gong flyers in Ms. Zheng’s bag. The couple began paying attention to Ms. Zheng and asked her questions about Australia. The couple perked up. The man said, “This is the first time we have heard about this.” They asked for more materials to read. The man then asked Ms. Zheng to take a picture for them.